Darts Games Glossary is divided into 2 parts and is dedicated to avid players around the globe. The first part or introduction is followed by dart game terms and includes a learning games section that defines rules and dart game versions. Darts Glossary is likely the most amusing at the site for the language of darts offers up rhyming and colorful terms like no other skill game. This area of gamerisms is sure to make you smile and yes, laugh out loud. Darts is a game using pointed arrows to throw strategically at a dartboard. The standard dartboard is divided into 20 segments in black and white color numbering 1 to 20 with a round circle in the middle of the board known as the bulls-eye or the inner bull in red color and the outer part of the eye called the outer bull in green. If the dart hits the black or white section of the board, it scores the number of that particular segment. Every number in each segment has two small rectangular scoring sections in red and green color. When a dart hits the outer bull in green color, it scores 25 points, and when it hits the bulls-eye--the red center portion of the board, then it is a 50 points score. The most popular, official games played are 301 and 501. 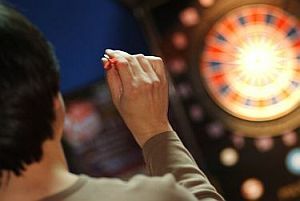 Two players take turns in throwing up to three darts each. Each one starts with a set score of 301 points or 501 points respectively. The aim is to minus whatever scores they have made from 501 or 301 set of points to reach zero when a winner is declared. 301 or 501: refers to dart/arrow games where the objective is to reduce your score to 0 from starting points of 301 or 501. Ace: the double of one in 501 and 301 games. Annie’s Room: also called Annie’s house. It refers to the number 1 on the board. Arrows: it is another term used for darts. Baby Ton: when a player scores 95 by scoring five 19’s. Bag o' Nuts: refers to 45 points for a dart throw. Bailout: jargon for misses on throw 1 and 2 followed by a third that hits the target. Barrel: term for the metal area where the thrower grasps the dart. Basement: darts games glossary term for double threes. Black Dog: when a double bull is scored. Black Eye: rack up 50 points for hitting the center of the bullseye. Bones: occurs when player must get a double-1 to arrive at zero. Buckshot: refers to 3 darts that land strewn about the board. Bombs/Bombers: big or heavy darts. 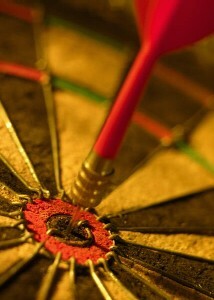 Bull/Bulls-eye: the centre part of the dartboard. Bull out: with that double bull, you win. Bull up: method of determining the first player to throw by aiming for the bull. Bullseye: section of the board center that has a single and double bull. Busted: jargon for having too many points at the end of a 301 or 501 game. Century: refers to 1 round=100+ points. Check-out: a throw, that if hit, will win and game over. Chips/Classic: jargon for 1 throw=26 points by hitting 20, 1 and 5. Chucker: darts player who carelessly throws without a target in mind. Clickity Click: lingo for 1 throw=66. Clock: lingo that refers to a dartboard. Convertibles: these darts can convert from steel to soft tip. Cork: darts games glossary for bullseye. Cracked: if a single is scored by a player when he/she aimed at a double. Cricket: a darts game that uses the standard 20 number dartboard with the treble and double rings. The goal of the game is to be the first player to close all the numbers and have a higher or even point total. To close a number, it must have scored 3 times on one or more turns. Example: hitting the triple will close a number=1 throw; a single and the double will close it=2 throws and three singles=3 throws. A scoreboard tracks hits on all numbers. Dead: when a player aims and hits the target on the board. Diddle for the Middle: method of determining the first player to throw by aiming for the bull. Similar to bull up. Dinky Doo: term for 22. Dirty Darts: questionable strategy here? Double bull or Double cork: area in the center of the bullseye=50 points. Double in or DI: act of a dart throw to start an 01 game that lands in the double section of a number. Double Out or DO: hitting the same area as DI to become the winning player of the game. Double Ring: is valued at double the specific number located at the outer ring of the board. Double Top: jargon for the double 20. Double Trouble: if a player is unable to hit double on the board needed to win the game. Downstairs: you are talking about the lower or bottom section of the board. Dust: when the dart hits the non-scoring area on the dartboard. If you are keen for the language of darts, then you are in the right place to follow through with your passion for this game. The fewest number of darts to throw a perfect game of 501 is nine. John Lowe first achieved this feat on television in the 1984 World Matchplay championships. He hit triple 20 six times in a row, followed by triple 17, triple 18 and double 18.